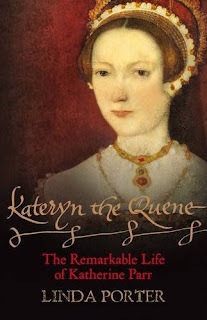 SYNOPSIS: The general perception of Katherine Parr, the sixth and last wife of Henry VIII, is that she was a provincial nobody with intellectual pretensions who became queen of England because the king needed a matronly consort to nurse him as his health declined. In the various studies of the six wives of Henry VIII she receives much less attention than Katherine of Aragon or Anne Boleyn. Her main achievement, in the famous rhyme about Henry's six wives, is that she 'survived'. Yet the real Katherine Parr was attractive, passionate (she had a mighty temper when aroused) ambitious and highly intelligent. She was thirty years old (younger than Anne Boleyn had been) when she married the king. Twice widowed, held hostage by the northern rebels during the great uprising of 1536-37 known as the Pilgrimage of Grace, her life had been dramatic even before she became queen. It would remain so after Henry's death, when she hastily and secretly married her old flame, the rakish Sir Thomas Seymour. Katherine died shortly after giving birth to her only child in September 1548, her brief happiness undermined by the very public flirtation of her husband and step-daughter, Princess Elizabeth. Despite the vivid interest of her life, this is the first full-scale, accessible biography of this fascinating woman who was, in reality, one of the most influential and active queen consorts in English history. This sounds fantastic! Katherine Parr has always interested me and I can't wait to read a biography dedicated to her! Oh, I'm looking forward to that one! Her biography of Mary Tudor was excellent. I have never read anything on Katherine Parr yet! sounds great! can't wait to read it. Oh wow! I really want this! So totally going on my wish/tbr list. It sounds amazing and I'm glad I saw your post as this book is not listed on GoodReads yet. There have been a few fictional treatments of her life lately, and it would be good to read a nonfic biography. Since Susan says the author writes well, this goes on my list for sure. Sounds fascinating! On my list it goes! I'm interested because I don't know too much about her. Thanks Amy! I'll be adding this to the wishlist quick smart! That sounds great! I've read hardly anything about Katherine Parr. She is intriguing to me in the fact that personally I wonder if she loved Henry? Since she had always loved Seymour? And THEN to have Seymour lusting after young Elizabeth, how hurt she must have been? I also find it sad that the girl she gave birth to didn't survive past two. But I wonder how much more information there truthfully is regarding Parr that has not been dealt with in all the many "Six Wives" types of non-fiction reads. I guess we'll just have to read it and find out, eh? I really would like to read this book. I admit to having a passion for reading about Henry's life, and I really don't know much about this particular queen. I always assumed that her story was just not that interesting, but this book claims to hold a different story. Thanks for spotlighting this book, I am going to put it on my wish list. I don't know much about Katherine Parr, and I absolutely LOVED Porter's biography of Mary Tudor so I will definitely be picking this one up. Thanks for the heads up! Catherine Parr has always fascinated me. I will absolutely be looking for this one. The research I did on Catherine Parr for NOTORIOUS ROYAL MARRIAGES led me to conclude that she really wrestled with the problem of marrying Henry when she was in love with Seymour. She more or less meditated on the question for some time and arrived at the religiously infused conclusion that God wanted her to wed Henry because it would enable her, an evangelical, to advance the infant "reformed" (or Protestant) religion. In fact, there was no way she could have said no. Sexually, Seymour floated her boat, but Catherine made peace with her choice. Don't forget that with the rare exception of Henry himself (who did so 5 out of 6 times) people (and particularly royals) didn't marry for love then. She did all sorts of things to entice him sexually (realizing that begetting that all-important "spare" -- a Duke of York -- was vital to Henry.) So Catherine took scented baths, as fastidious about hygiene as Henry was, and even ordered up yards of scrumptious black fabric to have "night gowns" (which were not negligees, but for lounging around one's bed chamber) made up for her wedding trousseau. I could have sworn I posted a comment, but Blogger must have eaten it. I did a lot of research on Catherine Parr for NOTORIOUS ROYAL MARRIAGES and I think that she didn't start out loving Henry, Marie, but of course she had no choice but to marry him. After her second husband, Lord Latimer died, she did become involved to some extent with Thomas Seymour, who certainly floated her boat sexually; but then the king began paying attention to her, and marriage to him was an offer one didn't refuse lightly. She seems to have made peace with the idea of marrying Henry, consulting her conscience. She was an evangelical, and after lengthy meditation on the subject, convinced herself that God wanted her to wed Henry because it would provide her the opportunity to advance the new "reform" religion. I think she did eventually come to love him in her way ... she did everything she could to entice him physically. She was an attractive woman (about 5'6 and auburn haired with a terrific fashion sense, and was just as fastidious about hygiene as he was). She ordered sumptious black textiles to be made into what they called "night gowns" (more like lounging around the house in the evening attire), took scented baths, groomed her eyebrows with a silver tweezers ... all to arouse him enough to conceive that "spare" -- the Duke of York he do desperately desired. Because there isn't that much written about Catherine Parr, compared to say, Anne Boleyn or Katherine of Aragon, I knew less about her going into my research and for that reason found what I learned to be more compelling. She became one of my favorite of Henry's wives. She was also one of only 7 Tudor-era women to have a book published. It became a best-seller, too! I am very interested in Katherine. I was writing a historical novel about her only to discover that many others were doing the same! I don't know whether to go on with it or not? Anyway I'm looking forward to reading this. Thank you very much for telling us about it! Oh Amy. I am seriously interested in this one.